Travelling is supposed to be fun, and it usually is. But, with any great adventure there’s always a risk. There are simply certain things out of our control. So, what if something bad happens? How will you handle something going wrong? 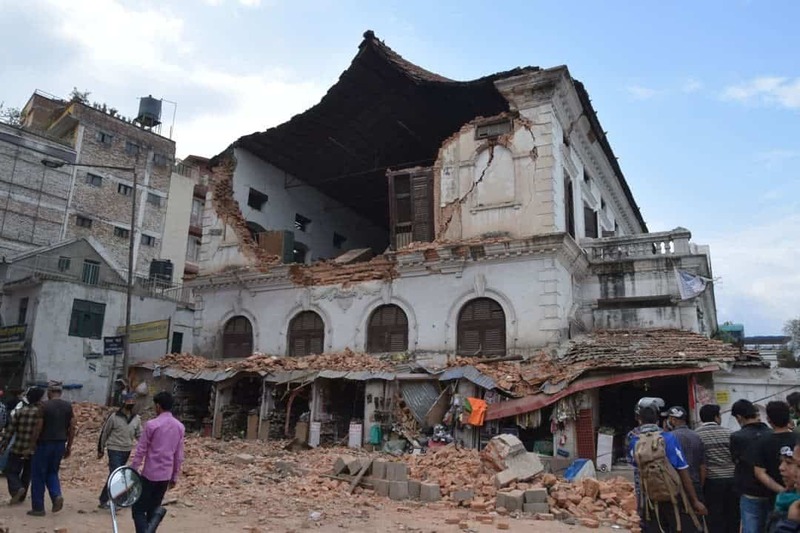 Something out of control, something very wrong, happened to us and everyone in Nepal on April 25, 2015. A 7.9 earthquake rocked the country, claiming the lives of nearly 9,000 people. 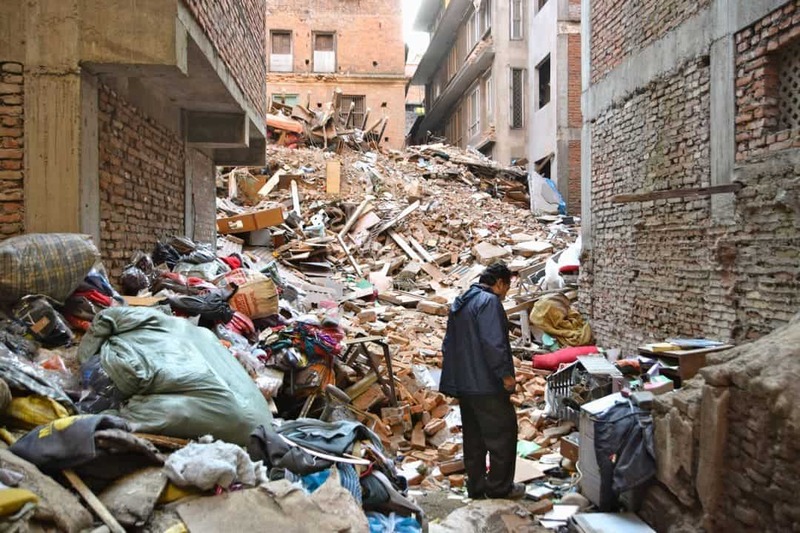 The city of Kathmandu and much of the countryside was left in ruins. In just 45 seconds, the lives of tens of thousands of people were changed forever. We had arrived in Nepal only a day before the earthquake. Trekking plansTrekking plans, rafting plans, everything was moved to the back burner and ‘Plan B’ became our only choice. Many people were griping about how unlucky they were to have their vacation in the Himalayas ruined. The way we looked at it, we were lucky. We survived this terrible tragedy. We were there, we were able bodied, and we were in no hurry to get home. There was no question in our minds – we were going to stay to help. After 6 weeks of intense relief work, and living through 4 of the biggest earthquakes in recent history we feel it’s our responsibility to share our experiences. Obviously, all situations (especially major disasters) differ. However, here’s some advice to prepare you for surviving a natural disaster abroad. You know you’re safe, but they don’t. CALL YOUR PARENTS!!!! It will mean the world to them. Try to get word home to anyone ASAP. I sent an e-mail to our families letting them know we were safe immediately after the quake. Moments later, mobile lines and data signals were jammed. 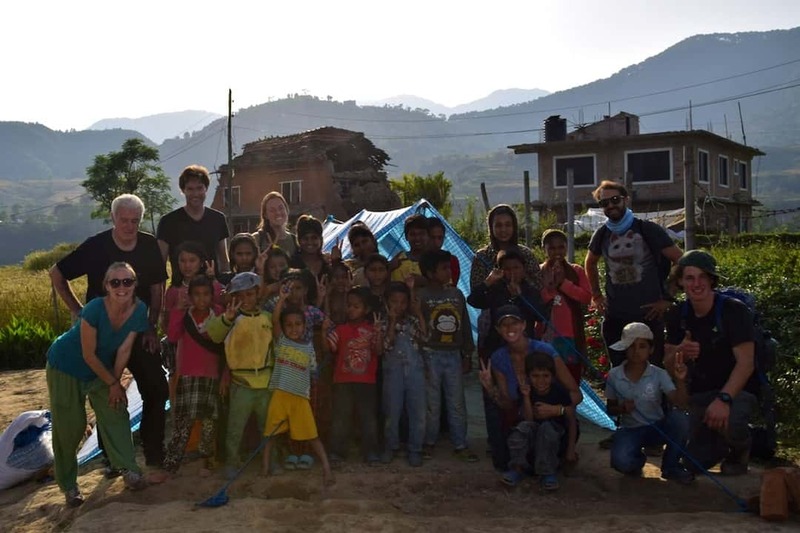 Surviving a natural disaster abroad truly taught us that food, water, and shelter really are all we need. 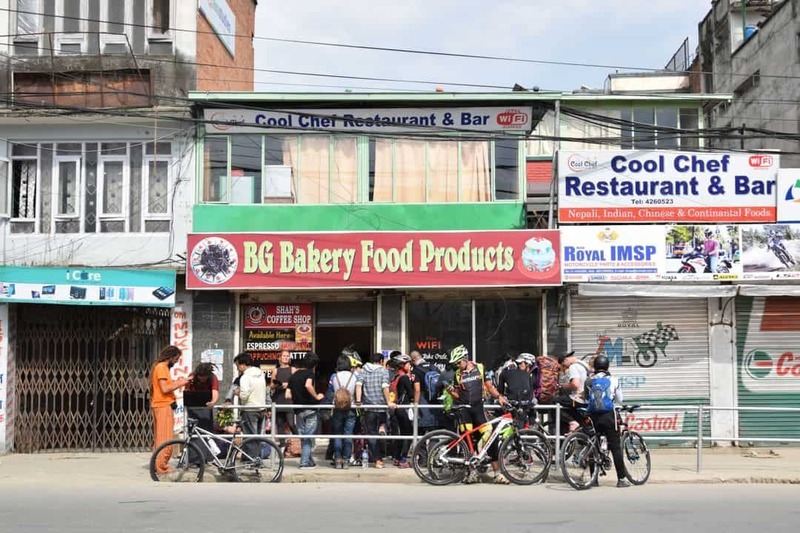 After the quake, stores shut their doors or quickly ran out of supplies. The few ATMs that were still working quickly ran out of money. Ask locals for a place where you can purchase a few days worth of sustenance right away. Don’t expect anyone else to take care of you. It sounds obvious but, it truly is important to check in with your embassy. We were actually very impressed at the how the US stepped up to make sure its citizens were cared for. They provided us (as well as those without an Embassy) with MREs (meals, ready-to-eat), water, and shelter. Hundreds of people were sleeping under event tents, away from any risk of crumbling buildings. Your embassy is also your best resource for news, and an evacuation plan. Some countries will even provide evacuation flights. This is a huge reason why knowing where your embassy is a good idea in each country or region you visit. 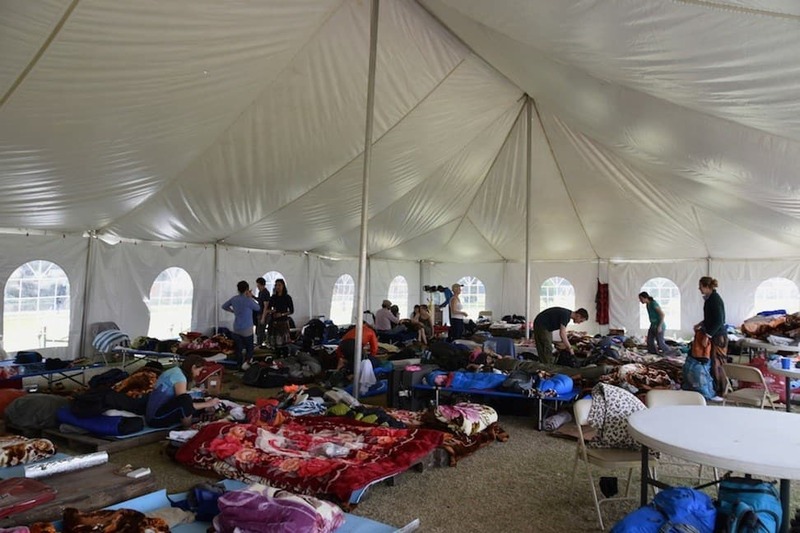 We slept at the US Embassy with over 100 people for 10 days after the quake. One thing this showed us, is that during dramatic times and after a traumatic experience, people sometimes forget that they aren’t the only ones on the planet. People in the camp were hoarding supplies, discarding rations they didn’t care for, making a mess, and just not considering anyone but themselves. Don’t be that person! It’s easy to change out water jugs, straighten up common areas, and just be friendly and willing to talk. Your kindness and positive attitude will go a long way in a situation that’s tough for everyone. You can stay and help with relief efforts (we did and learned a lot), or you can change your plans and move on. Either choice is fine, but don’t stay and be in the way. It’s not a great idea to hang around an insecure area without a plan. Don’t be a hero, DO NOT put yourself in harm’s way. You can actually causing more harm than good. If you can hook up with a legitimate relief group or start your own culturally conscious relief effort (like we did), go for it. If the area isn’t safe, then you should leave. Your embassy is a great source of information about what might happen next in the area and may give you a recommendation on what to do. If you do stay for relief efforts, realise that the road to recovery after a natural disaster is a long and hard one. Supplies will be difficult to come by at a time when so many people are in great need. Relief work isn’t easy. It is emotionally and physically tolling. If you’re interested in helping, getting in the right mindset will help ensure that you have a good experience. This is important because while those you are helping are generally grateful for your efforts, but they are also desperate and may see you as an “opportunity”. Try not to get attached or make promises that you can’t deliver on. It can be harmful in the long run. Hopefully, universe willing, you’ll actually never have to use anything you’ve learned in this post. If you do find yourself surviving a natural disaster abroad though, these tips will help keep you safe and sustained in both body and mind. 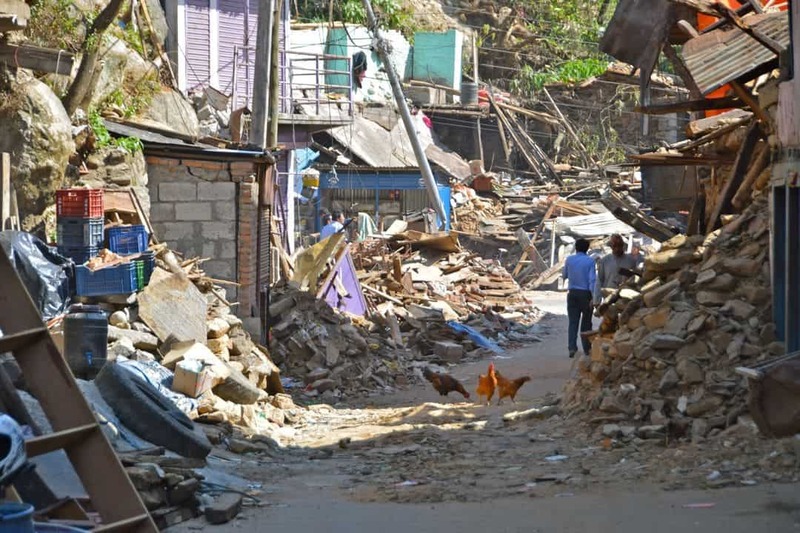 Read more about our post earthquake experiences in Nepal. Wow, intense… thank you for sharing. It’s amazing you guys had the courage and stamina to stay for those weeks and help. Respect. Rob and Kari are great people for sticking around and trying to help. So sad for Nepal. Specially call your parents is must thing you need to do and if you are able to help then why not. I really hope we never need to use this advise, but I’m glad you wrote about it. Also, staying in the area and being able to help, it really makes a difference. Even though travel plans need to be cancelled, it’s so much worse for those people who lost everything. Sometimes people lose sight of that. Very true Rieneke. Thank you for reading. Thanks for reading the post. It’s really true that sticking around and doing what you can does make a difference. It was an experience that was scary, humbling and sometimes crazy…but one we’ll never forget. We feel very close to Nepal to this day and are working on ways to get back and help some more if we can. Thanks again for reading! Safe Travels Always.